[Properties] Pale gray-brown; Slight fragrant and fishy taste. [Functions] Qing Re Jie Du, Huo Xue Hua Yu, Xiao Zhong Zhi Tong. It is used for Acute Hepatitis and Cholecystitis, Toothache and Pharyngalgia. [Usage and Dosage] Take 2-4 pills per time, three times daily. [Adverse Reaction] Individual person have slight side reactions such as: dizziness, dry throat and diarrhea. [Taboo] Gastroduodenal ulcer, renal insufficiency, Gastrointestinal bleeding, Pregnant women are taboo. 1. No smoking, no wine and spicy, cold, greasy food during taking this product. 2. Patients with diabetes, heart diseases, liver disease, kidney disease and other severe chronic diseases shall take medicine under guidance of physician. 3. Children aged and frail, shall take medicine under guidance of physician. 4. Hypersensitivity to this product should stop using. 5. Do not use this product if expired. 7. If you are using other drugs, please consult your doctor before using this product. 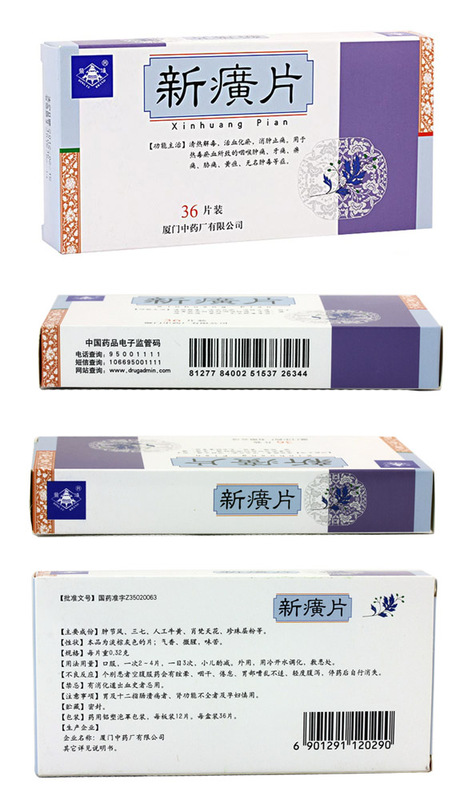 Xin Huang Pian is recommended as family normal medicine to treat Acute Hepatitis , Cholecystitis , to relieve Toothach and Pharyngalgia.